Technology has come a long way over the years and it’s hard to believe how far we have come in terms of our ability to connect with others. Technology evolves over time, so does everything along with it. As with all things in life, change is the only constant when it comes to technology as well. We have witnessed a technological evolution within a short span of time like it was yesterday and it’s unbelievable how things were 10 years back. We have witnessed it and probably done it, but we don’t know exactly what it is. We’re talking about cloud technology which has been around for quite some time now and we’ve been using cloud technology unknowingly through Amazon, Gmail, Google Docs, and more, and yet we know a very little about it. Let’s take a look at what it means to be cloud based and server based. The term cloud is in fact the internet and it’s everywhere. Cloud refers to a pool of shared computing resources available to the users on demand through web-based tools via the internet. The era of cloud started in 2006 when Amazon released its first cloud services, Elastic Cloud Computing (EC2) and Simple Storage Service (S3), which were used by businesses and organizations in more than 200 countries. The services offered by Cloud service providers and the number of cloud users have increased exponentially since then. The whole idea of cloud computing is to shift everything to the cloud so that user can access the data remotely without being physically present at a specific place. This makes data processing and storage convenient and efficient than ever. Many businesses and organizations have started adopting this paradigm as a potential game changer to their businesses. Server based computing refers to the applications running on the server. As the name suggests, the base for a server based network or system is the server itself, otherwise called as the centralized server. A server refers to a dedicated computer tasked with managing network resources. In simple term, a server is an instance of a computer program that accepts and responds to the requests made by other programs in the network, otherwise known as clients. The terms “server-based computing” has been around for several years and the idea behind it was to host data and other forms of resources on a central computer known as a server and the clients such as desktop computers and laptops request the server to share its resources with the clients. Cloud is everywhere and it manages the servers and network infrastructure management. The terms cloud-based refers to anything be it applications, resources or services that is made available to the users on demand through web-based tools via the Internet, as opposed to a direct connection to a server. It’s called “cloud computing” because everything from applications to data centers to services is found in the cloud. Server, on the other hand, is a computer program that provides services to other computer programs and their users. Server based computing refers to the technology by which applications get implemented, controlled, and operated on the server rather than the client. The term cloud refers to a pool of dynamically configured shared resources based on network technology where each user has access to its own private resource called cloud that is offered by a third-party cloud service provider. 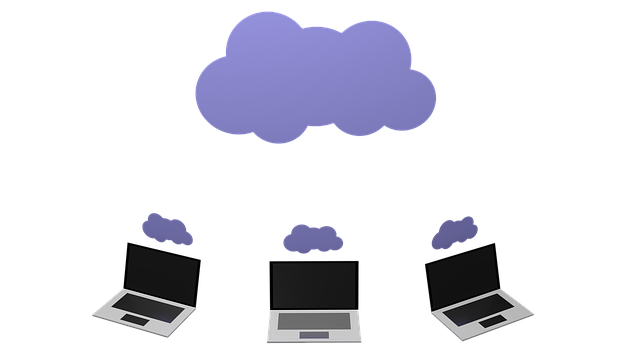 These cloud service providers deliver their computing resources over the internet which can be further accessed through a web browser. Server based computing, on the other hand, refers to the technology where a device or a program, otherwise known as a server, is designed to managing network resources. The servers accept and respond to requests made by another program, otherwise known as a client. A cloud based application is any software program or application that operates in the cloud space meaning it’s a program running on a cloud infrastructure and can be accessed over the internet by various computing devices through a web browser or a program interface. The cloud applications can be installed either on a private cloud or a private cloud. A server based application, on the other hand, refers to a program or application stored on a remote server and accessed through a browser interface such as a web browser. Servers provide different services such as sharing resources or data among clients along with data access and persistence. A cloud computing architecture is a conceptual model that encompasses all the components and subcomponents required for cloud computing in a cloud space. Cloud provides on-demand access to a networked pool of shared resources like servers, applications, storage, and networks, regardless of where the cloud is. Server architecture, on the other hand, is the basic foundation on which the server is created or deployed. It basically refers to a network in which clients request and receive service from a centralized server and the server then responds to the requests. It defines how a server along with its components is designed, maintained and managed as a whole. In a nutshell, there is a thin line between a cloud based application and server or web based application, and the line remains a blur as ever. This is because they possess a lot of similarities in terms of functionality, but there are noteworthy differences as well, especially when it comes to using cloud applications for the redundancy rather than using it for computing power. Any program that runs on the internet is said to be cloud based. In fact, everything that is tagged as a cloud product is software-as-a-service with online storage space and remote access. Server based applications refers to the applications running on the server. Sagar Khillar. 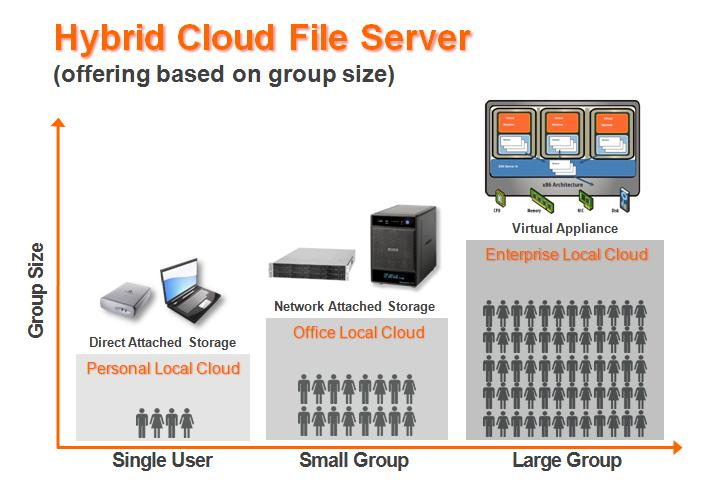 "Difference Between Cloud Based and Server Based." DifferenceBetween.net. 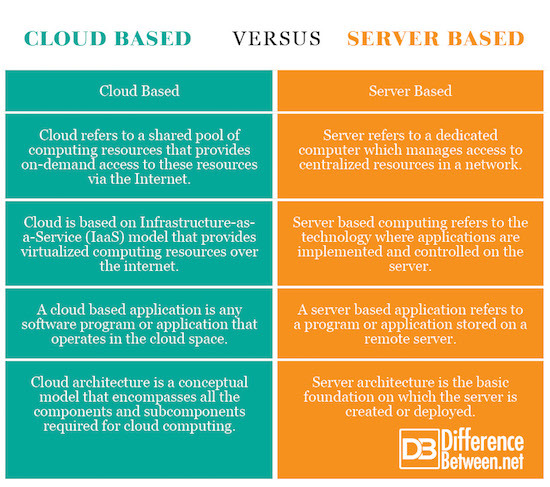 November 13, 2018 < http://www.differencebetween.net/technology/difference-between-cloud-based-and-server-based/ >.